The things that you find on the internet never cease to amaze. I was having a discussion with my SD and for some reason the talk turned to toilets and the like. She is a big fan of Aesop products and gave John and me some lovely things for Xmas from their range. She also was telling me about Aesop post poo drops (???) Evidently you put a few drops in the toilet and it eliminates odours without the need for sprays. I googled immediately and they are $20!! Obviously SD had more money than me or sense. So I got to thinking and googling and decided to give the essential oils a try. I bought some eucalyptus from the $2 shop and some ylang ylang as well. This was in the ingredients list on the Aesop one. Anyway it works pretty well and there is no need for the stinky sprays. Has anyone found a toilet spray that doesn’t smell like a toilet spray? Also they are $2.50 not $20. 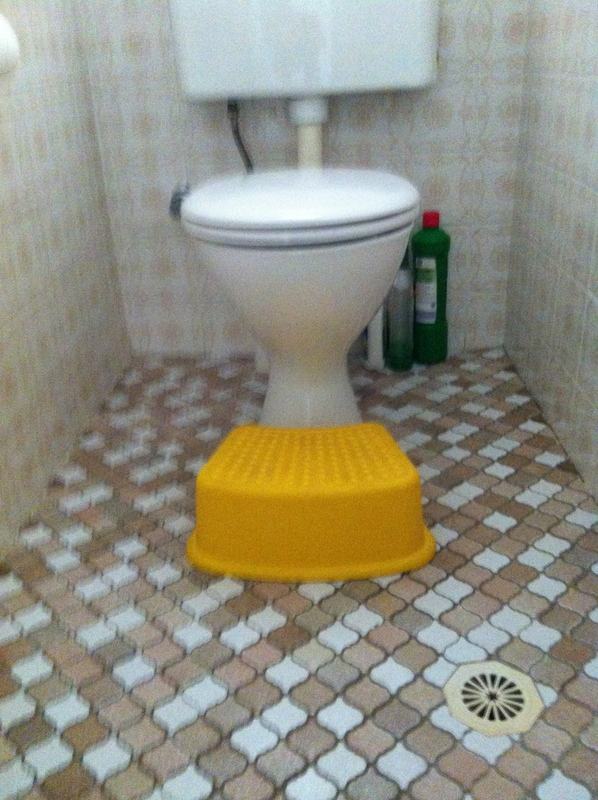 It’s called the ‘squatty potty’ and it raises your knees above your hips and puts your body at the correct angle to defecate (poop). Evidently it releases the puborectalis muscle that unkinks your colon and allows for better elimination. Please google it, don’t just believe me. Anyway, it kind of made sense to me. As a sufferer of Crohn’s(more on this later), bowel elimination is a hot topic. I’m thinking I might contact the manufacturers and ask for the Australian distribution rights. Meanwhile, I’m giving this a try and for $6, it’s doing its job. 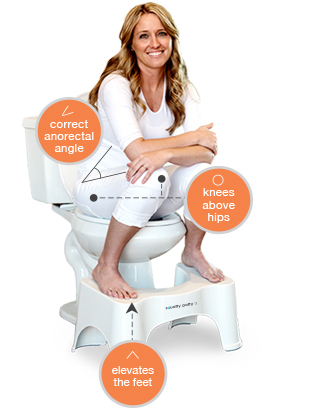 It’s the child step available everywhere and it raises your knees above your hips which is the aim (no pun intended) of the squatty potty. I think they could have come up with a better name than this, it’s a step after all. So there you have it, the ancient world and their ‘3rd world toilets’ had the right idea and some clever Westerner comes along and changes things and supposedly not for the better. I am seeing a return to the old ways in a lot of things lately. I think our ancestors were pretty much on the ball. For instance, the popularity of the 5:2 eating plan, the return to natural skin care e.g. oils etc, non processed food, less sugar – the list goes on. Why not toilets? This entry was posted in family, life, Uncategorized and tagged aesop, squatty potty. Bookmark the permalink.